BEAUTIFUL SOFT SHINY COAT & HEALTHY SKIN Our all natural pet conditioner restores softness and shine to your pet's fur while soothing itchy and dry skin. Our plant based formula helps fur to retain moisture by using the best conditioners found in nature - Aloe vera, jojoba oil and mineral oil. The botanical blend relieves itching, reduces skin redness, increases coat strength and luster, detangles, demats, promotes healthy coat growth and has anti-fungal properties that alleviate dandruff. HYPOALLERGENIC FORMULA FOR SENSITIVE SKIN Our natural conditioner for pets is 100% detergent free and does not contain any harmful chemicals, parabens or SLS, making it a perfect gentle conditioner for animals with allergies and other sensitivities. Our rich, cream rinse is 100% non-toxic and uses plants and oils to effectively condition and soothe your pet's skin and fur. LEMONGRASS FRESH SCENT A wonderful fresh aroma makes conditioning your pet a pleasant experience for you both! 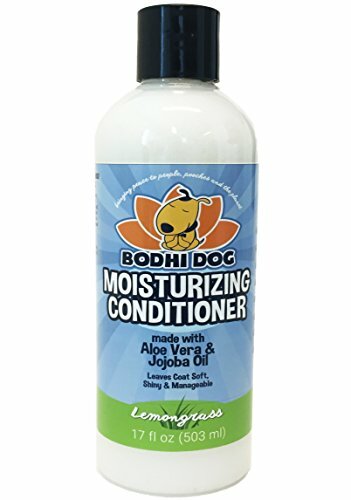 Our pet conditioner has a light lemongrass scent that leaves your pet smelling fresh for days. It is not harsh on your hands and works as aromatherapy for you while bathing your pets because of the natural essential extracts. Your hands will be soft and smell great afterwards too! OUR ETHICAL FAMILY COMMITMENT Proudly made in the USA with locally sourced, sustainable ingredients and animal cruelty free. Our socially responsible packaging is made with recycled materials is biodegradable and eco-friendly. 100% MONEY BACK GUARANTEE! If you don't love our Lemongrass Moisturizing Conditioner, let us know and receive a full, no questions asked refund. We are a small family owned business of pet lovers committed to you and your furry friend's happiness! If you have any questions about this product by Bodhi Dog, contact us by completing and submitting the form below. If you are looking for a specif part number, please include it with your message.